The Punjab Group of Colleges (also known as The Punjab Group) (PGC)has its roots in a Commerce College set up. The chairman of PGC network is Mian Amer Mahmood. The Network laid its foundation in Lahore in 1985. Over a period of last 31 years, PGC has become the Largest Educational Network in Pakistan. PGC has head office in 64-E/1, Gulberg III, Lahore, Pakistan. 3 chartered universities, 330 college campses in 100 cities, 15 Resource Academia Schools, 700 plus Allied Schools and nearly 300 EFA Schools. PGC Family consists of Educational Excellence Limited, National Communications Services (SMC-Pvt.) Limited and. Tower Technologies (Pvt.) Limited is a hi-tech company of the Group which provides technical expertise and tailor made IT solutions. National Educational Network (Pvt.) Limited, takes care of franchising Elementary, Secondary and Higher Secondary Education across the country in the form of Schools and Colleges. PGC as a progressive enterprise, includes 3 chartered universities, Capital University of Science & Technology - CUST in Islamabad, Mohammad Ali Jinnah University in Karachi, and University of Central Punjab in Lahore. 330 college campuses, 15 Resource Academia Schools, 700 plus Allied Schools and nearly 300 EFA Schools. PGC's National Communications Services (SMC-Pvt.) Limited owns and operates one of the Television Networks in Pakistan known as Dunya TV Network and Roznama Dunya a daily news paper in the communication network side. Punjab Group of Colleges, Gujrat Est. in 2008. Punjab Group of Colleges, Kharian, established 2011. ADP a new degree offered by Punjab Group of Colleges. The University of Central Punjab (UCP), located in Lahore, Pakistan, is a private sector university and is running under the Punjab Group of Colleges. The five colleges in the university are the faculties of Commerce, Management Studies, Information Technology, Engineering, and Law. Mohammad Ali Jinnah University (MAJU) is a private university in Pakistan named after Muhammad Ali Jinnah. The main campus is in Karachi; the other campus is in Islamabad. MAJU was established in 1998 after the grant of a charter by the Government of Sindh. MAJU, unlike some other institutions, which have a degree awarding status only, has a status of a comprehensive university. The university is affiliated with the Punjab Group of Colleges. The Capital University of Science & Technology (CUST), located in Islamabad, Pakistan, is a private sector university and is running under the Punjab Group of Colleges. The university offers undergraduate and post-graduate programs with a strong emphasis on business management, applied sciences, engineering and computer science. Hadaf Group of Colleges is a hallmark project of Punjab Group of Colleges (The largest educational network in Pakistan) that has laid its first brick in the city of flowers “Peshawar” for delivering that quality of education which is craved by every academically inclined individual. Punjab College of Science (PCS) is a medical and engineering college in Pakistan. Its head office is located in Lahore. It is running under the Punjab Group of Colleges. For students desirous of pursuing science subjects, Punjab Colleges of Science was set up in all the major cities of Punjab where students mainly study F.Sc. Pre-Engineering and Pre-Medical courses. Punjab College of Commerce (PCC) is a private commerce educational institute in Pakistan which has 39 campuses all around the country. 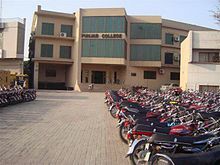 PCC was founded in 1985 by the Punjab Group of Colleges, and now it has become the largest group of a private college in commerce and related fields. Resource Academia (RA), founded in 2003, is a private fee-paying academic institution located at Lahore, Punjab, Pakistan, as part of the W-block compound. Resource Academia provides preschool education, primary education, secondary education and preparation for General Certificate of Education (GCE). It is affiliated with the Punjab Group of Colleges. Allied Schools is a school system and a group of schools in Pakistan. This school system is working under the Punjab Group of Colleges. Its founder & chairman is Mian Amer Mahmood. It is spread all around in the Pakistan. EFA School System is a school system working under the Punjab Group of Colleges. EFA School System is committed to provide Education For All (EFA) to children across Pakistan. EFA Schools, therefore, pledge to achieve high literacy rate by supporting to parents' affordability to educate their children. Its founder & chairman is Mian Amer Mahmood. It is spread all around in the Pakistan with 150 Branches. The Punjab Group of Colleges have over 700,000 alumni.